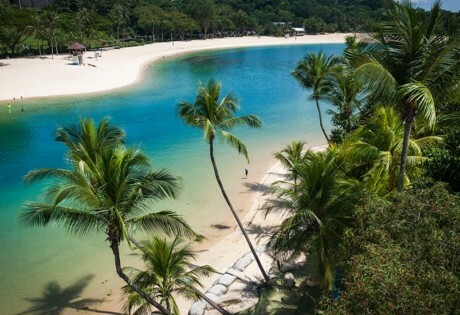 Be it riding thrilling rides at Universal Studios Singapore or relaxing by the shore with cocktails at Tanjong Beach Club, it’s time to experience island life in Sentosa! Whoever says that Singapore is a boring place has clearly yet to read our take on things to do in Singapore. 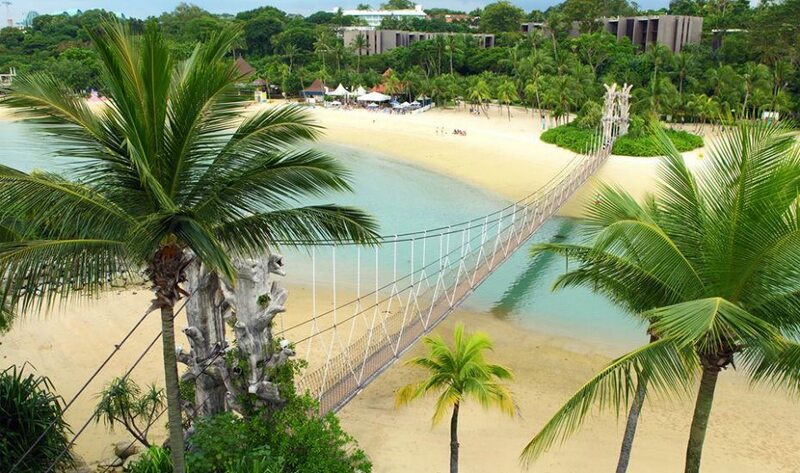 Well, one of our favourites is to get out of Singapore (ironically) and head over to Sentosa Island. Why, you ask? ’Cause this popular island resort has a list of amazing world-class spots that offer a smorgasbord of fun-tastic activities. Turn up those thrills already! Singaporeans don’t know how to have fun? Nonsense. Nothing beats this award-winning theme park for all things fun and thrilling (head’s up: it’s got the Best Amusement Park in Asia title in 2017). There’s a roller coaster and attraction for everyone, from the scaredy-cats to the adrenaline junkie. And if there aren’t any crowds and queues (fingers crossed) you can zoom through all the rides in this park in an hour or two, and do it all again. For the kiddos, there are Minions to meet, and coming up, Trolltopia (parents, you know this is huge). Come on, indulge your inner kidult and get on that heart-pumping Revenge of the Mummy ride. Forget your tiny fish tanks, and go for the big boys. 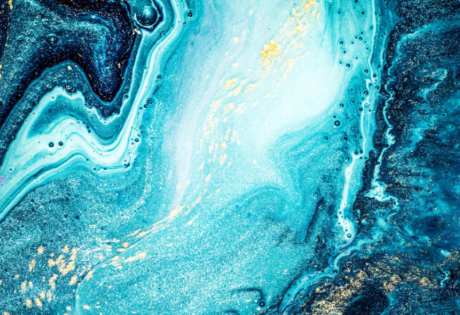 Yup, we’re talking S.E.A Aquarium, home to more than 100,000 fishy friends in every shape, size and colour imaginable — think sharks, manta rays, giant octopuses, dolphins, clown fishes and seahorses. We’re big on having a wander through the super cool shark tunnel (which houses over 200 sets of sharp teeth). Tired of admiring them through the glass? Top your visit by heading to the rock pools where you can touch and hold some weird and wonderful creatures. Wade around rays? We’re sold. 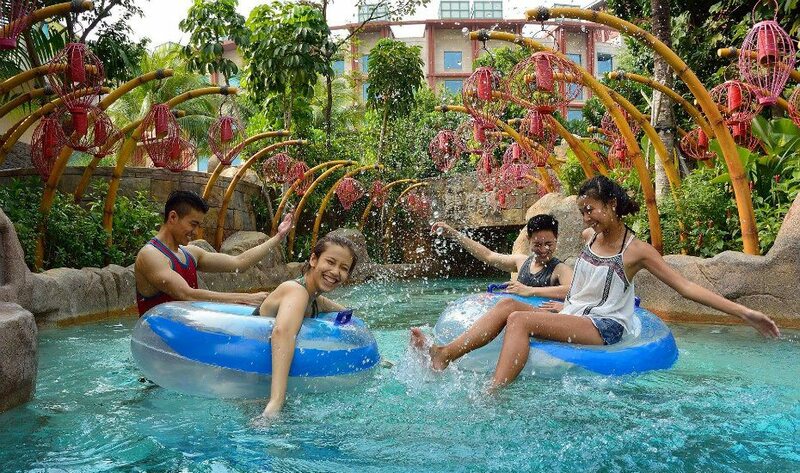 One for the fam, Adventure Cove takes water play to the next level. Make a splash with its massive slides and water-coasters. 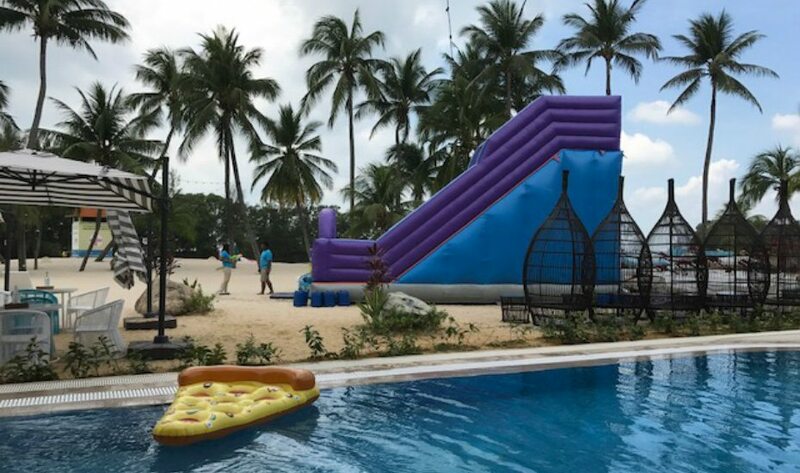 And if you prefer nothing too extreme for the lil’ one (or yourself — hey, who are we to judge), bob around in the lazy river, race around the wet maze or jump the waves in the main pool. Make a pit stop at the colourful Rainbow Reef where families can get up close and personal snorkelling with over 20,000 aquatic animals! Can’t stand the heat? We got one attraction in the bag that’ll have you kicking the same amount of fun indoors! 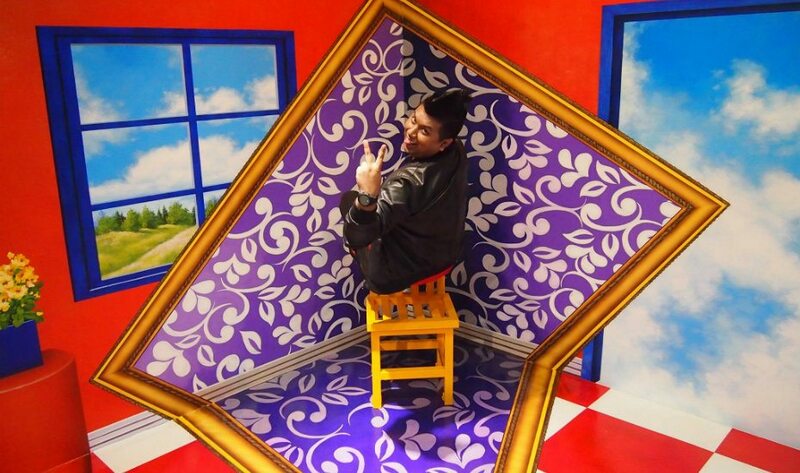 The Trick Eye Museum is one of our top picks for both families or anyone up for some snaps that’ll trick viewers (haters will say it’s photoshopped). Step into this interactive museum for some seriously funny photos courtesy of clever visual trickery, and see yourself turn into one flexible ballerina, a giant or being devoured by a sea monster! 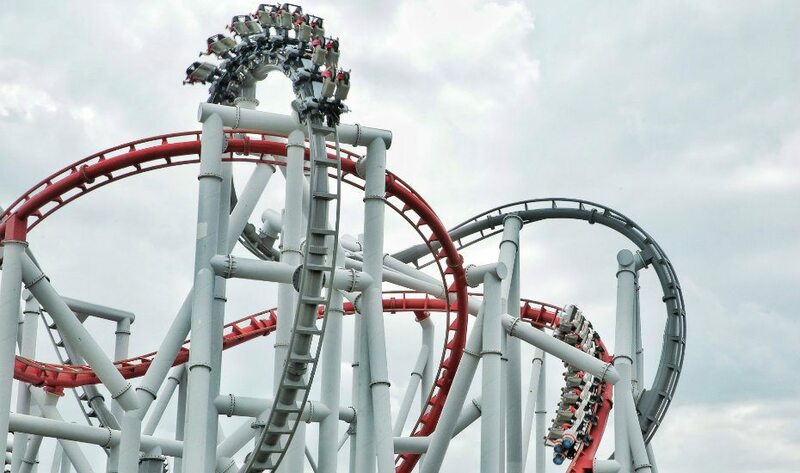 Roller coasters are not everyone’s cup of tea, but with this 4D motion-simulated virtual roller coaster ride, you really will believe you are flying to the top of a mountain, plunging back down into a valley and through white-water rapids. All the fun without the fear! Journey to the centre of the earth in Journey 2 or saddle up and start shooting the bad guys in Desperados, a 4D interactive shootout game. Roll out the red carpet, the celebs are here! 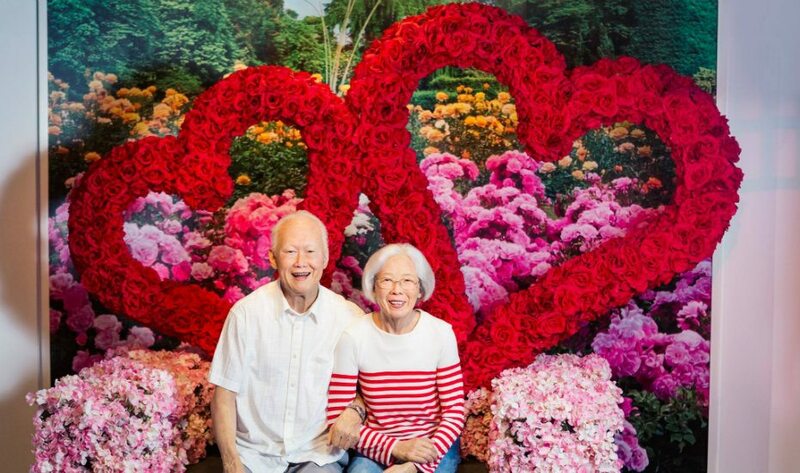 More like their wax counterparts, rub shoulders and take a million selfies with your favourite sports, music, Hollywood and Bollywood stars, as well as political leaders like the late Lee Kuan Yew. Local stars also make a cameo in this international attraction, including Stefanie Sun and Fandi Ahmad. Finish off the tour with the Marvel 4D Experience, where your fave superheroes are brought to life! If hurtling down a zip line is not up your alley, switch for something grounded. Forget about dangling legs in the air, you’ll have yours pressed onto the Segway board as you zoom through a circuit full of twists and turn. Challenge yourself by opting The Segway Eco Adventure, and explore the sights of the island during a scenic ride along the beaches of Sentosa on your Segway PT. If you’re into high-flying adventure, Mega Adventure Park is where it’s at. The star of the show is MegaZip, where you can fly like an eagle down a 75-metre high zip line at up to 60km per hour over the jungle canopy of Imbiah Hill. Not one for the faint-hearted, but oh-so worth it — take our word! Once your wobbly legs have recovered from the Zip, you can take on the ClimbMax, ParaJump, NorthFace and MegaBounce… if you have nerves of steel! Plan to catch some waves and hang ten with the mates? With Singapore’s lack of huge, crashing waves, Wave House Sentosa is your best bet. Beginners can ride on artificial, indoor waves by opting for the Double Flowrider where the water runs at 32km/h. And if you’d like to take your surfing skills to another level, go for the Flow Barrel where the water rushes as fast as 48km/h — careful not to wipe out! Looking for the ultimate thrill-seeking experience? It doesn’t get much more exhilarating than skydiving! No aeroplanes or parachutes are involved so kids get to enjoy all of the fun, too! First-timer packages come with a training session, complimentary flight gear, personal training from a flight instructor and a flight certificate to prove that you and your small team of skydivers have defied gravity! 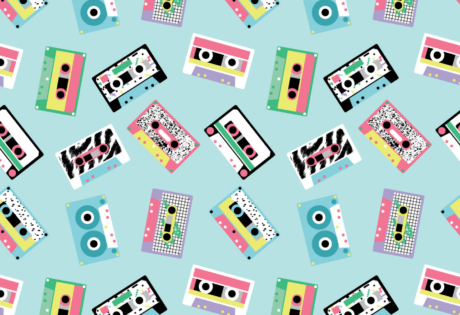 Fancy a blast to the past? Look no further than Fort Siloso. Learn why the Fort was built and find out just what life was like for a soldier from times of old. You will also get to explore the underground ammunition stores and check out the WWII guns. End the tour with a visit to the Surrender Chambers to witness the two historic surrender moments that changed life in Singapore during WWII. This legendary half-lion, half-fish icon is hard to miss: it towers 37 meters high! 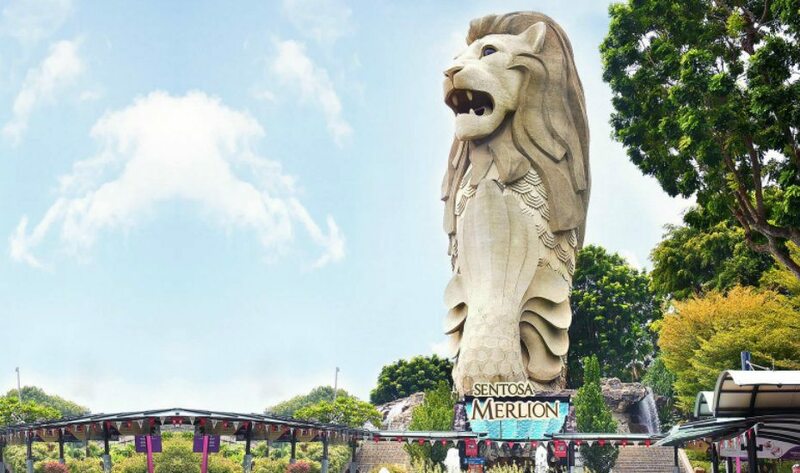 Head up to this statue for breathtaking views of the Lion City. And if you want to make your day out all about the Merlion, then why not track down and check out the other six statues that reside around Singapore? Nestled in a former monorail station, the 1.8-kilometre Nature Walk will lead you through Imbiah forest reserve where you’ll discover birds, insects, wildlife, habitats and plants that can be found on Sentosa. We bet no one with a camera can resist snapping a cool pic for the next Instagram upload. Besides being the island of fun, Sentosa is Instagrammer’s paradise — thanks to its heritage and greenery. 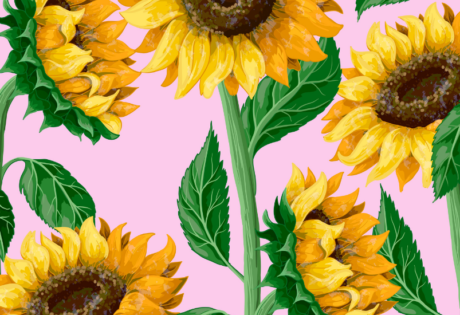 We’ve sussed out eight locations for your snapping pleasures and #OOTD shots, ranging from popular tourist spots to the lesser known nooks and crannies of the island — check them all out here. Tip: Bring a good eye and sense of adventure (as always) for this one! Nevertheless, you can never ever truly experience island life until you hit the beaches. 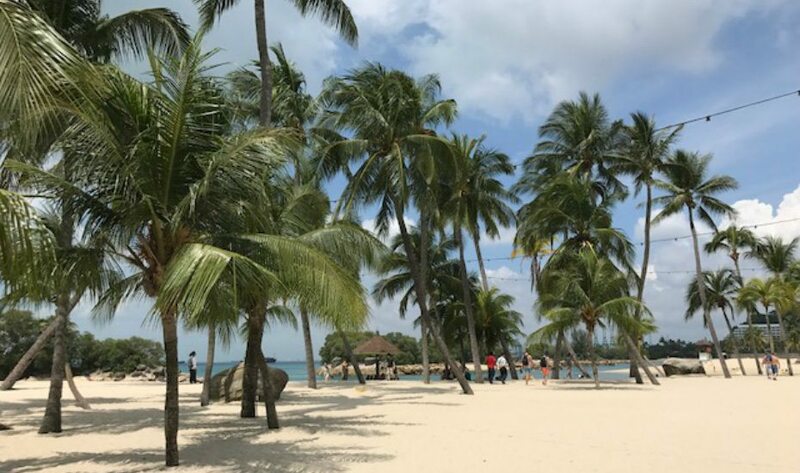 Sentosa – one of Singapore’s most iconic vacation spots! 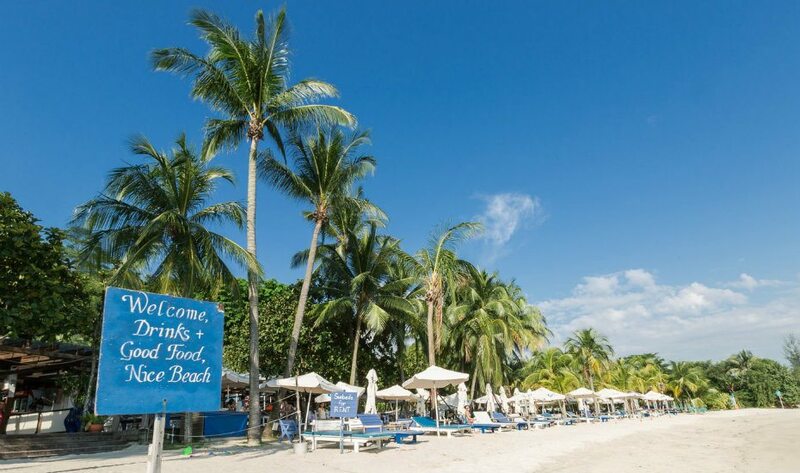 And we definitely are most fond of Siloso Beach for its fun-loving summer vibes. It may not be the most pristine stretch, but you can indulge in a plethora of water sports and chill with some beach grub by the water. At night, feel the sandy shores come alive with bar music and hip parties. This is one of the more family-friendly beaches around, with the epic Palawan Pirate Ship water play park located nearby. It’s also where you can find the iconic suspension bridge, which links Palawan Beach to the Southernmost Point of Continental Asia, so get your cameras ready for some nice photos when you’re on an outing here with your fambam. 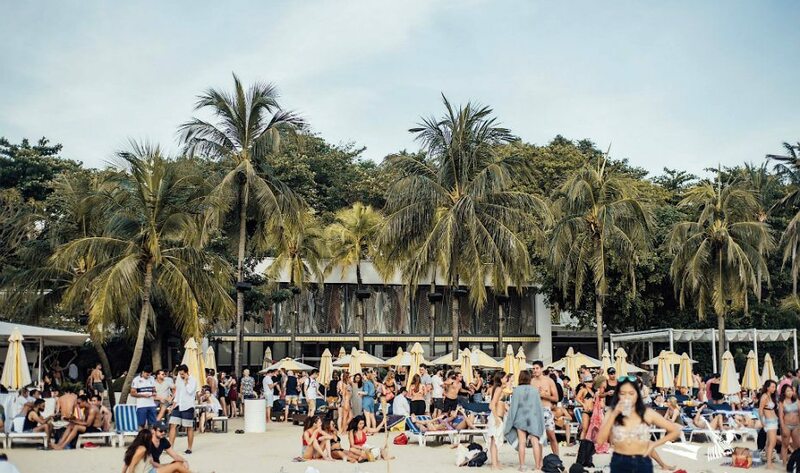 Join in the fun at Tanjong Beach, which is also home to everyone’s beloved Tanjong Beach Club. It’s well known as the beach for party-goers, but also offers a great view of the water if you are just looking for somewhere to curl up with a book and a drink. After all, it’s tucked away at one end of the island. While dining in Sentosa may cost you a tad more, this island does offer loads of great options, from affordable eats to family-friendly restaurants serious fine dining. loads of scrumptious food. Definitely worth checking out: the Malaysian Food Street near USS! Here’s where you can get delectable authentic fares from the Peninsula like KL Claypot Rice, Penang Hokkien Mee, Klang Bak Kut Teh and the like. 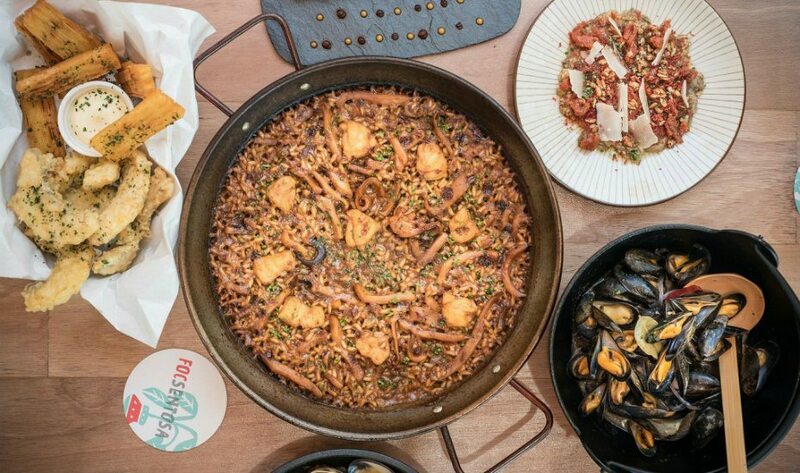 Fancy satiating, contemporary Mediterranean dishes such as seafood tapas and paella? Dine with panoramic views and a mix of indoor and outdoor spaces, including a pool deck and beachside sunbeds, at the award-winning FOC Sentosa. For a taste of Greece, head over to Mykonos on the Bay. 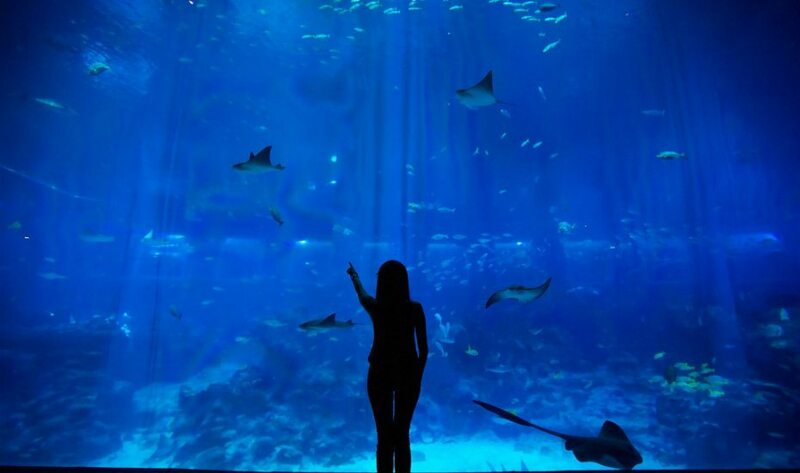 For a unique concept, dine in the heart of the S.E.A Aquarium, with a view of over 100,000 marine animals, at Ocean Restaurant by Cat Cora. Book a table at the Cliff for a romantic, sunset date; this swish alfresco dining spot does a solid Italian-inspired degustation menu. 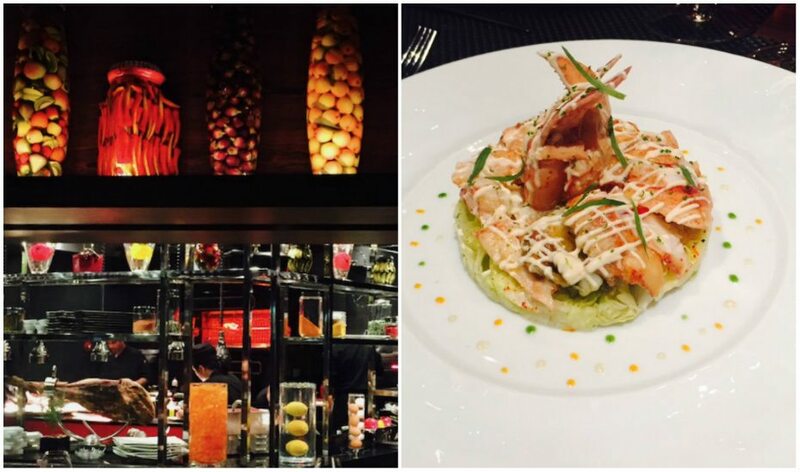 For Michelin-star fine dining on Sentosa, Joël Robuchon Restaurant and L’Atelier de Joël Robuchon, are must-dos, Other star restaurants at RWS include Forest, helmed by local chef Sam Leong, and Osia Steak and Seafood Grill. Hit the shores for a balmy beach party worthy of the most devout sun worshippers. Named one of the world’s top 50 best beach bars, the plush daybeds, great grub, and sweet pool makes it a perfect spot to watch the sun sink and rise into tomorrow. 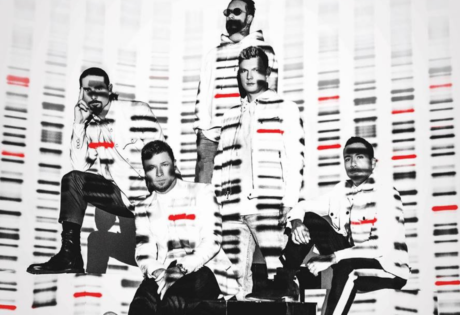 Their wicked carnivalesque parties with a slew of international DJs means we get our fix of weekend beach parties before ZoukOut rolls around again. Come for the food, stay for play in the pool, and dance in the sand to the island tunes. This serene hotspot is a favourite amongst the laidback crowds. It’s unpretentious, comfortable and perfect for when you need a break from the dancing crowd in super styled beach clubs. No need for stylish beachwear here; laze away (in whatever you please) on the sun loungers with a couple of frozen margs’ and crispy calamari. Shoes are optional at beach gastrobar Coastes — an ideal spot for catching the sunset at Siloso Beach with live music in the background. Its signature chicken wings and extensive cocktail menu are proven to be crowd-pleasers, so be sure to order those first. Vibrant and charming with its white and blue decor, here’s where you can dine only a mere distance away from the sea. Let your hair down and kick back at this groovy, sun-kissed beach bar. Fans of live music can enjoy regular gigs, while those who want to frolic the afternoon away can choose from a wide variety of ice-cold beers (make sure to check out the sweet bucket deals as well!). And if you’re hungry, choose from tasty bites like the deep fried luncheon meat kafti pastry, mini grilled pork burger with curry mayo, or split a duck & arugula pizza with your mates. 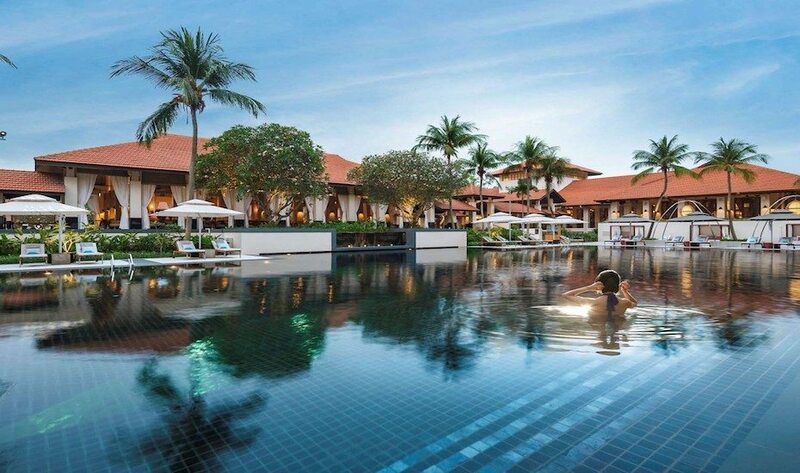 If you’re staying on this incredible island resort for more than a night, there are plenty of unrivalled accommodation offerings on this beautiful island, including W Singapore-Sentosa Cove for those in a party mood, Capella Singapore for those seeking a five-star stay, and the ever-swish Movenpick Heritage Hotel for a view of the iconic Merlion. Explore your options by looking through our round-up of outstanding hotels in Sentosa to aid you with your decision-making. Situated in the exclusive Sentosa Cove, take a breather from the bustle of the city and enjoy world-class dining at Quayside Isle. From Asian and European cuisine to casual cafes and fancy restaurants, there’s something for everyone at this Sentosa hotspot. Craving for Chinese food? Casual Chinese dining establishment Blue Lotus offers classics like crispy egg noodles, Szechuan-style spicy chicken, and chilli pomelo crab – a stellar signature dish. For a taste of the South Indian, pair items like the tandoori murgi and rogan josh with a single malt whisky from the fine bar of Earl of Hindh. Obsessed with pizza instead? Try joints Solepomodoro Trattoria-Pizzeria for smashing versions of the iconic Italian creation. Those who love communal dining can opt for Spanish tapas hangout Sabio by the Sea Tapar Bar & Grill, or Greek restaurant Mykonos on the Bay. For something a little different, try Brussels Sprouts – the family-friendly (and pet-friendly too!) outlet specialises in Belgian cuisine and offers an extensive menu featuring items like beer-battered fish and chips (with Belgian fries) and homemade Belgian waffles with Chantilly cream. Aside from the reliable internal transportation network of Sentosa bus and beach trams that can bring you from one attraction to another, you can also use the Sentosa Express to get from one part of Sentosa to another. And guess what? Travelling within Sentosa via these modes of transport is for free. So, here’s the important question: how do we get to this island resort? 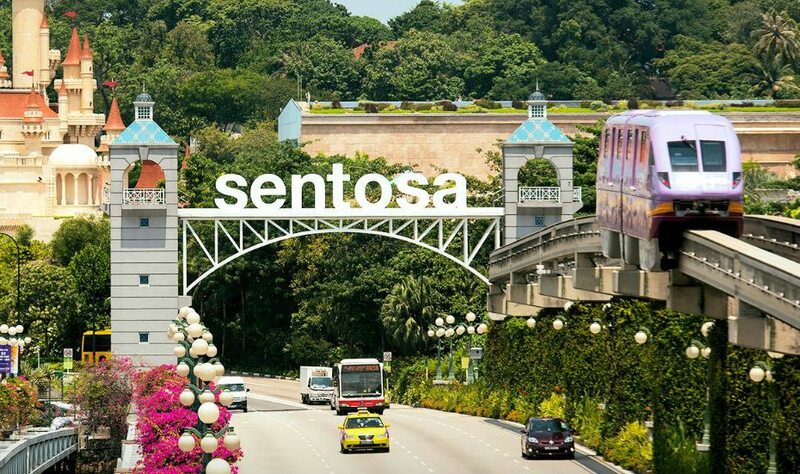 There’s a flat gantry admission for each car/cab entering Sentosa, starting from $2 per entry. There are also several parking lots in Sentosa – Sentosa Cove Village Car Park, Beach Car Park, Imbiah Car Park, and Tanjong & Palawan Car Park. More information can be found here. 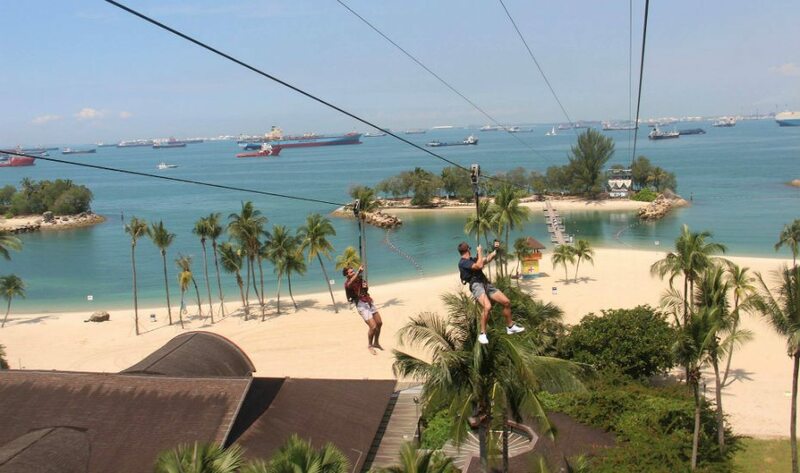 Enjoy an aerial overview of Sentosa as it brings you straight to the attractions hub of the Island: Imbiah Lookout. Head here for more details on getting to Sentosa via the cable car network. Enjoy a leisurely stroll from VivoCity Shopping Mall’s waterfront promenade to Sentosa for free (only till December 2018). Psst…there are two-way canopy-covered travelators to ease the journey. 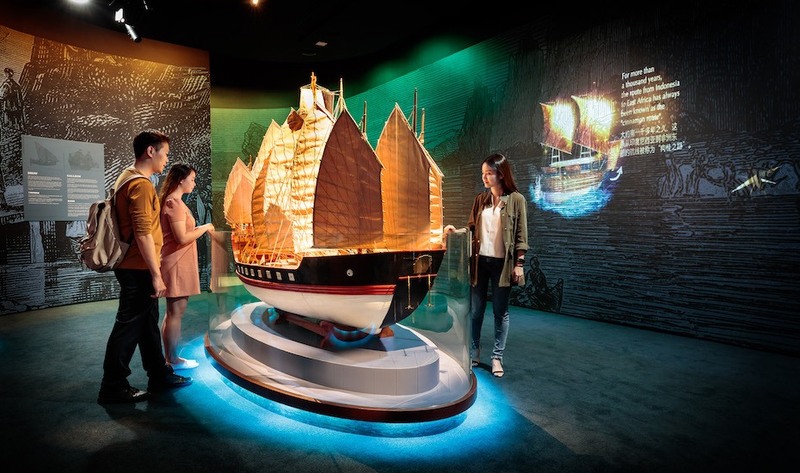 As one of the more popular modes of entry especially among the general public, the Sentosa Express – situated at VivoCity (Lobby L, level 3) – offers easy access to the island.